I have literally held thousands of antique Russian icons in my hands. I can usually tell you pretty quickly what a Russian icon is worth, what time period it is from, and what story is being told. I can quickly identify if the painting is new on an old board or if the cracks are fake (to make the icon look older than what it is). Occasionally, our firm comes across an antique Russian icon with a story as interesting as the iconography and I thought I would share one such example with you. If you know anything about Russian history, you know who the Tsarevich Alexei Nikolaevich Romanov is. His story is for another blog post, because today I only have time to tell you about this one icon. The icon itself depicts his name saint (in Russia, it was very common to commission a Russian icon of a saint that shares the name of the intended receiver – in this case, the Crown Prince) Saint Alexei Metropolitan of Moscow. The icon itself depicts the 14th century saint in the distinctive dress of his office, including an elaborate klobuk, vestments and panagia. With his right hand, St. Alexei delivers a blessing and his left hand holds a crosier. The entire icon is overlaid with an extravagant riza comprised of intricately woven silver-gilt thread. The klobuk is covered with a profusion of seed pearls and displays a cross set with cut amethyst. The vestments themselves are further decorated with paste stones and panagia is carved mother of pearl depicting a bust of the Virgin. 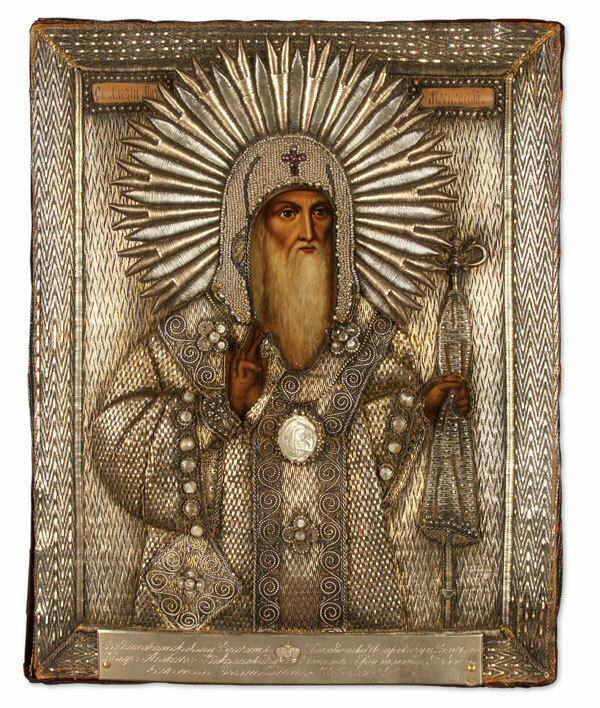 The head of St. Alexei is encircled with a sunburst style halo consisting of alternating silver and gilt rays and the upper corners with inscribed title plaques framed in a border of seed pearls and sequins which identify him as “The Holy Alexei Metropolitan of Moscow”. The lower margin of the icon has a substantial applied silver-gilt engraved dedicatory plaque set with the Imperial crown which reads, “To his Imperial Highness the Crown Prince Tsarevich and Grand Duke Alexei Nikolaevich, The God-protected on his tenth birthday, 30th July 1914”. The icon measures 12.5 inches x 10 inches (31.4 x 25.5 cm) and each plaque is hallmarked St. Petersburg, circa 1908-1917 and with a maker’s mark of A.K., which likely is for Alexander Karpov and also has the mark for the 84 silver standard. So, as the dedicatory plaque states, this icon was gifted to the Crown Prince by the Sisters of the Dormition Convent and the Abbess Angelina. It is of course well known that many members of the Russian Imperial family regularly received gifts for a variety of occasions including their birthday. The Tsarevich, who was the heir to the throne – he was the only son born to Emperor Nicholas II and Alexandra Feodorovna, was known to have received multitudes of icons over his short lifetime depicting a variety of subjects including (quite frequently) others like this icon which depict his name saint, Alexei of Moscow. 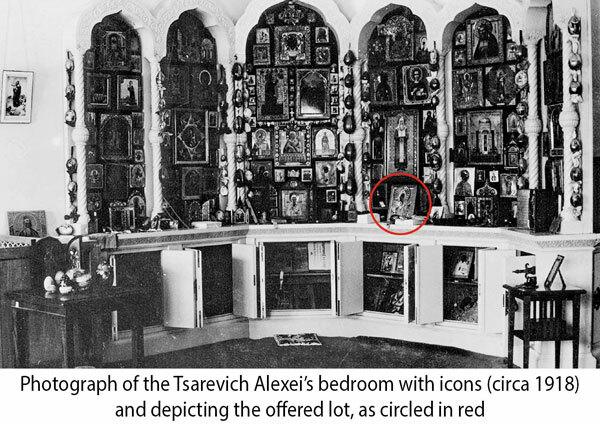 However, part of what makes this icon interesting is that while it has certainly changed hands over the last 100 years, we can trace it back with certainty to the Tsarevich because photographic evidence exists of the icon pictured in his bedroom. The photo, circa 1918, verifies that the Prince had in his bedroom a substantial cabinet of six arched niches each holding a vast amount of icons gifted to him. This icon appears on the lower shelf at the base of the third niche from the right immediately below another icon of St. Alexei. We know a little about the convent and sisters which gifted the icon to the Prince. The Kholmogorisk Dormition Convent was founded in the 18th century, built on the hills overlooking the Northern Dvina River, about 125 miles south of the port city of Arkhangelsk on the White Sea. As described in “The Historical Description of the Kholmogor Dormition Women’s Monastery” (printed in 1911), the monastery (convent) operated an icon painting workshop which employed 12 painters at the time. Additionally, the monastery also housed a gold and silver embroidery workshop which specialized in finely woven icon covers (rizas) such as the type that you see in this icon. It also mentions that the monastery had the good fortune to present their works to “Supreme Individuals” including (according to their archives) Empress Alexandra Feodorovna (1904) and in 1885, His Highness Grand Duke Vladimir Alexandrovich. 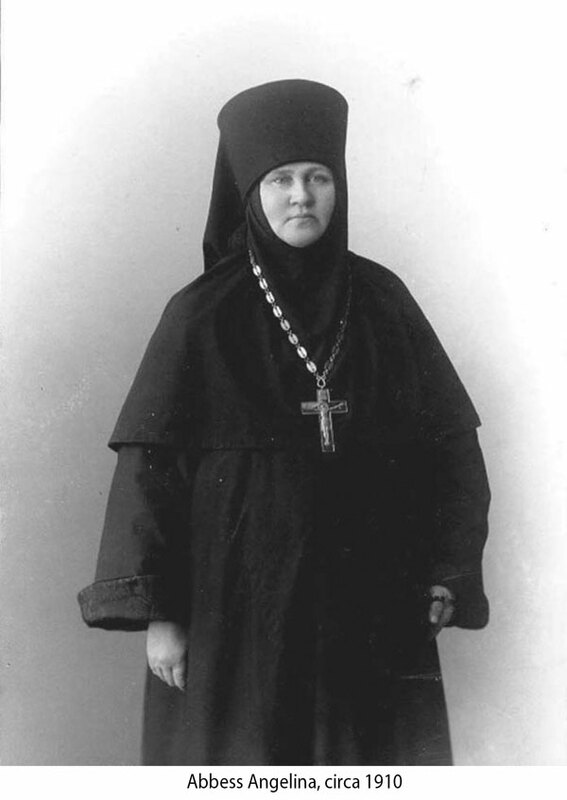 The Abbess of the Convent at the time, Abbess Angelina was born into the world as Matron Alekseevna Spehina in the year 1854. She was the daughter of peasants and at the age of nine in 1863, was admitted to the orphanage school for girls located in the monastery. At age 33, she became a novice and about a year later, a nun. Not long after, she was given the responsibility of treasurer. On the 19th of July, 1906, Abbess Evparaksiya died. A little over a month later, Angelina was voted the 18th abbess of the monastery. In 1909, she was awarded the pectoral cross of the Holy Synod and in 1916, the gold pectoral cross from the Cabinet of His Imperial Majesty. She remained abbess up until 1920 when the monastery was eventually closed by the Soviets and converted into a prison. After that, there appears to be no record of the Abbess Angelina. However, there is a legend amongst the locals that one of the abbesses was walled up in one of the niches within the monastery. And of course, it is well known that the young Tsarevich also met a tragic young death. One month shy of his 14th birthday, in the early hours of July 17, 1918, Alexei, along with his father (the Tsar), his mother, and all his sisters were brutally slain by Bolshevik Secret Police. So, this icon passed from the Tsarevich and from there we don’t know exactly where it went. It was likely in the hands of Mosgostorg and also probably with Armand Hammer, where it was likely acquired by an American collector. Eventually, the antique Russian icon made its way to auction at our firm in May of 2016 where it sold for $50,000.00. Icons have often been called the “Windows into Heaven” but in cases like this particular icon – with a rich and storied past, one could also call them “Windows into History”.